Dr Des Sinclair has witnessed many remarkable miracles in the course of his healing and evangelistic ministry. For over two decades he and his wife Ros have travelled throughout Africa. He has seen a man raised from the dead; he has been released from prison in extraordinary circumstances. He has preached the gospel in the face of fierce opposition, particularly from Muslim groups. He was thrown out by his father when just 11 years old. He has been abused, imprioned, tortured, sentenced to death - yet in obedience to the perceived call of God he has pressed on. His conviction, shared through story after story, is that when you put your life on the line for God, it will become a life-line for others to hold on to. 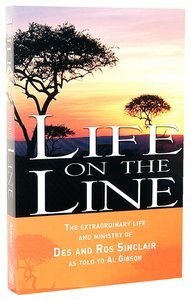 About "Life on the Line"
Customer Reviews For "Life on the Line"
I found this book to be a real eye opener into the spirit realm. I found it to be a MUST READ for all readers, as it was so fixating. I found it was written in an easy read format, and although it is an autobiography, it is written like a novel to make it easier for the reader. I found it very exciting, heart pounding, emotional (yes, even for us guys), pure and simple, and especially down to earth. Each chapter was true as it happened and not 'puffed up' and exadurated. I also found it to be 'reachable' with what the content was all about and where it was taking me. I found I could flow with it easily. And then most importantly of all, I found my spiritual relationship with God has gone to new heights as this book opened both my eyes and my heart further to God and his unfailing loving kindness.